Candying slices of citrus fruit is done using a similar method to candying citrus zest, but takes longer. Candied citrus fruit is not only a gorgeous dessert or in-glass beverage garnish, but delicious as well. This technique can be used with almost any variety of lime, lemon, or orange. We haven’t tried it with fresh yuzu fruit yet, but suspect the results could be very good. Meyer lemons are delicious, and candied blood oranges make a particularly striking garnish (but are a little bit more on the bitter side, so take that into account when choosing a dessert). Because citrus slices float, you can’t candy as many of them in a pot as you can pieces of zest. For large batches you may want to use multiple pots (or keep your slices particularly thin and try to reuse your syrup). 1. Thoroughly wash the surface of each fruit. Slice them no more than ¼” thick and remove any seeds. Don’t use slices with high amounts of pith (the end pieces). 2. In your widest pot, combine the water and sugar. Heat them to a boil, then reduce the heat to a low simmer. For safety’s sake, we recommend using a high-sided pot rather than a deep sauté pan. Stock pots are ideal. 3. Add the citrus slices and use metal tongs to nudge them around, so they lay in a single layer. 4. Simmer the slices until the peel and pith have begun to turn translucent, which can take anywhere from 40 minutes to an hour and a half depending on the thickness of your slices and the fruit used. Carefully flip the slices once or twice during the simmering process to ensure both sides get a good coating. You may have to reduce the heat slightly as water simmers out of the syrup. 5. Use the tongs to remove the slices from the syrup when they are finished cooking. Place the slices on wax paper, parchment paper, or a silicon baking sheet to cool. 6. 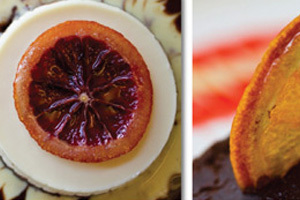 Use the slices to garnish your favorite finished dessert. We recommend either cutting them into wedges or serving them with a knife, as the pith can be a little difficult to tear with your teeth or the side of a fork. Depending on the consistency of the syrup after the slices are finished, it can be reused in various ways. If it’s still mostly liquid, you can reuse it for more slices or add it to sorbet or cocktail recipes. If it has become viscous (having reached the soft ball stage (240°F) or hotter), you can continue to cook it to make hard candy. Boil it until it reaches the hard crack stage (295-310°F) and very carefully pour it onto an oiled baking sheet or silicon baking mat in a pan. Before the sugar cools enough to harden, quickly score it with the blade of a knife coated with cooking oil. Once the candy has cooled completely, you can snap it into pieces along the scored lines.